The Breeden Co., a commercial real estate developer based in Virginia Beach, has set Sept. 10 as the date for a grand opening of one of its largest apartment projects in the Richmond region. The $70 million Marshall Springs at Gayton West, located in the Short Pump area of Henrico County, will offer 420 units, 306 of which already are leased, according to Peyton Tata, director of marketing and public relations for Breeden. The property has one-, two- and three-bedrooms with rents ranging from $1210 - $1570 per month. 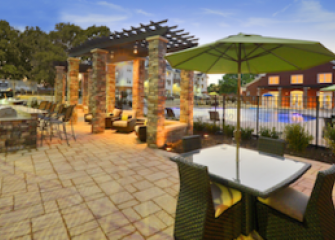 Amenities at the gated community include a picnic pavilion, outdoor cabanas with fireplaces, furniture and plasma televisions, , a dog park with watering station, pool and media center. The community is located at 4501 Marshall Run Circle on 30 acres on the north side of Interstate 64 across from Short Pump Town Center. The site is near Gayton Road, which recently saw the opening of the North Gayton Road Extension, including a bridge over I-64.